You can only outrun your problems for so long before they catch up. The Washington Capitals’ early-season issues were never addressed by head coach Todd Reirden, so it’s no surprise that they’ve stumbled into a 3-6-3 rough patch following a hot start. Generating enough offense to overcome your flaws throughout an entire year is a tall order that borders on impossible. At some point, the forwards will lose their wind and require some support to stay afloat. During this slump, the offense has produced 2.75 goals per game compared to 3.65 prior to the slide. The defense hasn’t merely failed to hold up its end of the bargain, though. After allowing 2.86 goals per game in 37 contests, it’s taken a complete nosedive by conceding an average of 4.17 goals over this 12-game stretch. Even when it’s firing on all cylinders, Washington’s eighth-ranked attack can’t offset that level of leakiness. With Alex Ovechkin, Evgeny Kuznetsov, Nicklas Backstrom, John Carlson and a number of solid complementary scorers, the offense was bound to recover. 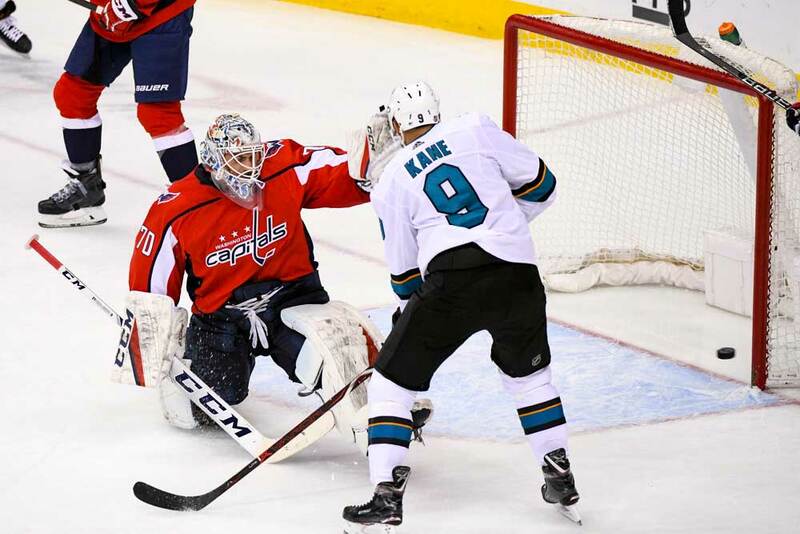 It certainly bounced back against the San Jose Sharks on Tuesday night, as the Caps tickled the twine six times. However, they lost 7-6 by giving up three straight markers late, including the game-tying goal with one second left in regulation. That back-breaking tally highlights just how fundamentally poor Washington’s defense has become lately. Matt Niskanen chases Joe Pavelski up the boards in the waning moments of the game, which is a baffling decision considering the fact that he’s a blueliner, winger TJ Oshie has already claimed the assignment and San Jose has pulled its goaltender for an extra attacker. As a result, the Caps are outnumbered 4-2 in the slot. Guess who gets to the loose puck first: not any of Washington’s players. Evander Kane then has a gaping net in front of him and tucks the puck in to crush his opponents’ spirits. Strangely enough, these defensive woes aren’t the result of a weak possession game. True, Reirden’s troops rank 23rd in CF%, but that’s nothing new. In the 37 games preceding this slump, their CF% was 48.3. In the eye of this current storm, their CF% is 48.6. Whether they’re winning or losing, they don’t own the puck. The possession story was largely the same under former Caps head coach Barry Trotz (48.0 CF% last season), who focused most of his attention on converting chances into goals. He rode this counterpunching strategy all the way to a championship and is working similar magic with the Islanders this year. The difference between Washington now and then is not puck possession but puck management. When its defensemen do have the puck, what are they looking to accomplish? Too often, they’ll attempt flashy, low-percentage plays at the offensive blue line. That’s a recipe for odd-man rushes coming back in the other direction. Dmitry Orlov is perhaps the guiltiest culprit, as he regularly bites off more than he can chew. This type of ambition from the back end simply isn’t necessary. Would these gambles add to the Caps’ production if they were successful? Sure, but the risk isn’t worth the reward when the offense is already dangerous in its present state. A simple breakout pass will do the trick when you have high-caliber forwards leading the charge. When Trotz left for Long Island, it seems as though a bit of structure did as well. In addition to their ill-advised choices, the defensemen frequently take lazy angles in coverage. During zone exits, the spacing is out of sorts, with forwards suffocating the blueliners and thus limiting their passing options. Though Washington is potent enough to get away with these hiccups every once in a while, it isn’t feasible long-term. We’re seeing this right now…and we’re only about halfway through the season. When the games become tighter and begin to separate the wheat from the chaff, you can’t be turning pucks over for free and handing the opposition chances on a silver platter. Especially given the situation between the pipes. Braden Holtby (3.04 GAA, 90.6 SV%) is having another pedestrian season in net, and his struggles have been magnified by the team’s sloppy defense in January (3.94 GAA, 88.4 SV%). He’s a step behind when tracking the action and often appears handcuffed by harmless shots. Backup Phoenix Copley (2.98 GAA, 90.3 SV%) hasn’t fared much better in his limited outings. While their jittery performances aren’t doing the blue line any favors, it isn’t helping them out much either. Whether it’s Orlov, Niskanen or youngster Jonas Siegenthaler, the back end has dropped the ball of late. Even Michal Kempny and Carlson, who have operated well together as a pairing for most of the year, have let the club down during this ugly stretch. Reirden and his staff must get their act together. Drill them hard in practice and go over film to emphasize the gaps, angles and decisions they want from their defensemen. Don’t hold on to it for too long. Fine-tune the spacing on the breakout. If there are no safe options, don’t force anything. This isn’t about establishing a new identity. It’s about refining the opportunistic formula you’ve set in place. If you’re going to live and die by this sword, sharpen it, polish it, ensure that it’s in pristine condition so that you maintain a decided edge. At the moment, their numbers are slipping. They allow 3.16 goals per game (22nd) and rank 23rd on the penalty kill. Clearly, staying out of the box would help too. Even with this forgettable 12-game segment, Washington sits second in the Metropolitan Division. However, the playoff battle is ramping up while the Caps are trending downward. They need to address their sore spots before they dig themselves a hole that’s too deep to climb out of. Fittingly, their title defense may well rest on their ability to defend.